I started my life as a performing musician with the Penn Balalaika Orchestra in 1972, then directed by Stephen Wolownik. I stayed on to direct the orchestra until about 1978. I played with Tom Walker and Patty Guz in the Troika Balalaika Trio. 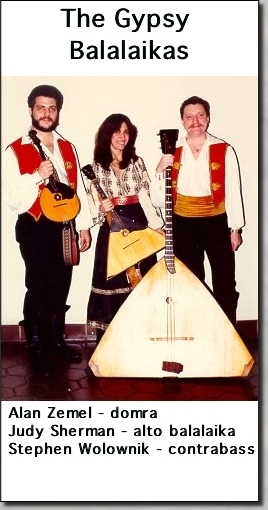 When Steve returned to Philadelphia in 1980, he, Judy Sherman and I formed the group The Gypsy Balalaikas. We played together for over twenty years in the Gypsy Balalaikas and the reknowned cabaret ensemble Balalaika Russe, until Steve's death in 2000.